Want to learn to talk Korean? Master some easy Korean conversation? Good. 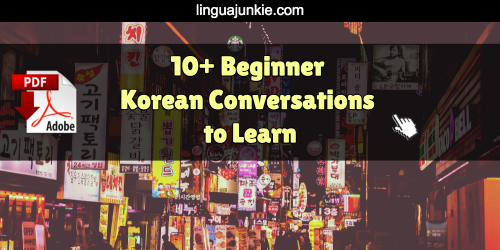 Today, you finally learn 10 simple Korean conversations. In fact, if you print this page and re-read (out loud) it every now and then, they’ll get stuck in your brain for good. Yes! You’ll also get the translation for each one. By the end, you will know 10 Korean conversations. ..you should also HEAR the native pronunciation, right? So, here’s a free Korean Conversation Audio Lesson. Just press play below and enjoy!! by KoreanClass101.com – Click here to get more of these easy lessons. This is a simple Korean conversation script. You’ll just learn how to ask about things. Julia: 그것은 “인스턴트 누들” 입니다. This is a basic Korean conversation that all beginners should learn. All about introducing yourself. Tim: 안녕하세요. 저는 팀 입니다. Julia: 안녕하세요. 저는 쥴리아입니다. 만나서 반갑습니다. annyeonghaseyo. jeoneun jyulliaimnida. mannaseo bangapsseumnida. Hello. I am Julia. Nice to meet you. Tim: 저도 만나서 반갑습니다. 저는 미국사람입니다. jeodo mannaseo bangapsseumnida. jeoneun migukssaramimnida. Nice to meet you, too. I am American. Because repetition is the mother of all learning. Here, you get a slightly more advanced Korean conversation script. Sungho: 네. 안녕하세요. 저는 완갈시아입니다. Yes. Hello. I am Juan Garcia. Mr. Garcia: 안녕하세요. 저는 이성호입니다. 반갑습니다. Hello. I am Sungho Lee. It’s a pleasure to meet you. Yes. It’s a pleasure to meet you. Another basic Korean conversation dialogue. Yes, it’s a bit silly and unlikely to play out in real life but it’s always good to learn these things. Foreigner: 죄송합니다. 한국말 잘 못해요. Sorry. I don’t speak Korean well. Okay, this one is a bit too simple but that’s okay. It means you won’t get overwhelmed. Want to ask someone about their plans in Korean? This Korean conversation will help you do that. Tom: 미나 씨는 내일 계획이 있습니까? Mina ssi-neun naeil gyehoek-i isseumnikka? Do you have plans tomorrow, Mina? No, I don’t have any plans. Tom: 그럼 내일 남대문에 갑시다. Then let’s go to Namdaemun tomorrow. Taehyeon: 태현 씨… 저는… 태현 씨를 좋아해요. taehyeon ssi… jeo-neun… taehyeon ssi-reul johahaeyo. Taehyeon… I… I like you. Taehyeon: 태현 씨는… 저를 싫어해요? Taehyeon… You don’t like me? Mina: 네… 좀… 안 좋아해요. 미안해요. ne… jom… an johahaeyo. mianhaeyo. Yea. I kind of don’t like you. Sorry. Sungsoo: 안녕하세요, 경미 씨. 성수입니다. Hello Kyungmi, this is Sungsoo. Sungsoo: 지금 12시 15분입니다. 우리 극장에 몇 시에 갑니까? jigeum yeoldu si sipo bun-imnida. uri geukjang-e myeotsi-e gamnikka? It’s 12:15 now. What time are we going to the theater? se si samsip bun-e gamnida. Kyungmi: 세진아 오빠 컴퓨터 할게. Sejin, I’m going to use the computer, okay? No! I want to use the computer. Now that you have 10 Korean conversation scripts, what’s next? How can you get some good Korean conversation practice from this? Speaking fast is a sign of expertise. When native speakers notice this, they’ll understand that you’re good “enough” and don’t need to stop and think of every word. 3) Review these Korean conversations as much as possible. Nobody masters things on the first try. If you want these to be in your head, you need to review them for a few minutes per day. 4) Print this page out. That will make the reviewing easier. 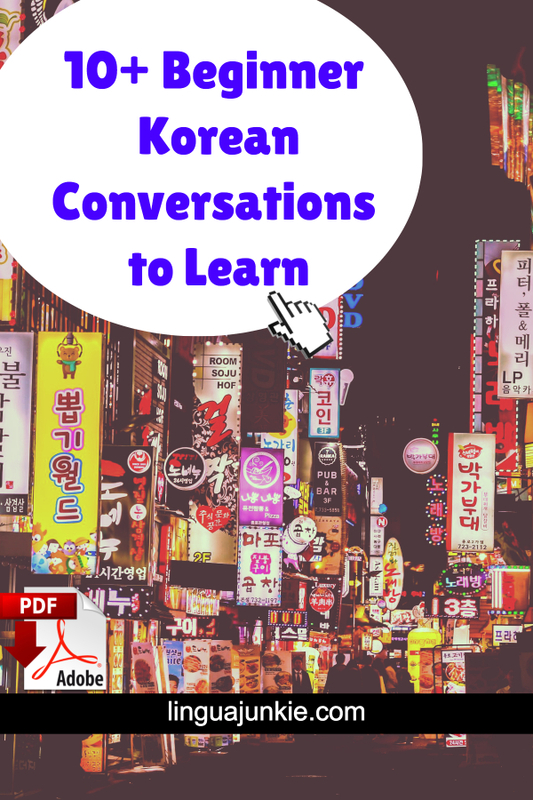 And if you want, you can also get the Korean conversation PDF for practice. Click on the image below to download it. Previous Previous post: BIG Collection of Learn Spanish PDF Lessons – FREE. Next Next post: How to Say Hello in French in 11 Fluent Ways.